L-R: Tyler Reese, Caldwell district manager; Mark Dula, South Caldwell High School; Jeff Joines, Blue Ridge Energy board president; Kimberly Hindman, Collettsville Elementary; Abby Hudgens, Granite Falls Elementary; Chad Davis, Gateway School; Lynn Aydlett, Valmead Elementary, Kelly Melton, Blue Ridge board member; and Sara Jo Starnes, Hibriten High School. 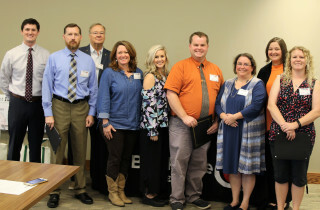 Exciting, hands-on learning projects are coming to Caldwell classrooms thanks to $4,173 in Bright Ideas grants awarded recently by Blue Ridge Energy to local educators during a special luncheon honoring winning teachers and their principals. Bright Ideas is an academic grants program sponsored by Blue Ridge Energy in conjunction with North Carolina Electric Membership Corporation and its 26 other member electric cooperatives. Bright Ideas grants help further traditional academic learning by funding innovative scholastic projects that go beyond available school funding. Abby Hudgens of Granite Falls Elementary for “Full STEAM Ahead for ESL.” This $250 grant will encourage English Language Learners to unleash their creativity and language opportunities through simple, hands-on manipulatives and applications. Mark Dula of South Caldwell High School for “Spartan Land Mapping.” The grant for $700 will increase student knowledge of surveying principles, land mapping, and civil engineering applications by conducting exercises and real-world assignments outside of the classroom. Students will use transit and precise measuring equipment to develop the angular geometry required for accurate AutoCAD drawings. Sara Jo Starnes of Hibriten High School for “Timelooper: Using Virtual Reality to View Historical Sites.” This $530 grant allows students to experience historic moments in American and world history using virtual reality. The grant for $1,103 incorporates social study lessons, literature, and dramatic play to teach children about diversity and tolerance with a primary focus of acceptance and understanding of people with disabilities. Chad Davis of Gateway School for “Gardening in Schools.” This $400 grant will teach the importance of agriculture-economic sustainability and help students learn about plant-human correlations while giving students a sense of belonging and achievement. The $1,190 grant will update, replace and enhance outdated science equipment. Previous equipment limited the ability of students to work directly with classroom materials. Blue Ridge Energy received 81 applications for the 2018-2019 school year from schools in its service area of Caldwell, Watauga, Ashe, Alleghany, Wilkes and Avery counties. Funds totaling $22,499 were awarded to 26 classrooms to benefit hundreds of local students. To date, Blue Ridge Energy has awarded more than $469,000 in Bright Ideas classroom grants that has impacted over 100,000 of local students and teachers. Blue Ridge Energy is part of several North Carolina electric cooperatives providing Bright Ideas grants. Together, they have provided more than $11.5 million for classroom projects impacting over 2.2 million students in North Carolina. Blue Ridge Energy is a member-owned electric cooperative serving some 74,000 members in Caldwell, Watauga, Ashe, Alleghany, Avery, Alexander and Wilkes counties. To learn more about the Bright Ideas grants program, visit Blue Ridge Energy’s web site at www.BlueRidgeEnergy.com or contact your local Blue Ridge Energy office.